The White Mosaic decorative curtain rod and finial set provide a high fashion style with a matte white finish rod and textured acrylic glass finials. These finials are sure to add just the right amount of glam and sparkle to your decor. This set will provide a visually balanced appearance for your window treatments. The 2.5" diameter x 2.4" long finials will insure that your window curtain panels will remain securely on the rod. The 1" diameter iron adjustable curtain rod is designed to fit a wide range of window widths, and has a sturdy 25 lb. capacity that will support flowing sheers to thermal blackout panels. The 3.5" fixed depth projection bracket provides a gracious amount of space for fabrics to drape perfectly. Accommodates window curtain panels and drapes that are designed with various tops, including: rod pocket, pinch pleat, grommets, tab top, or hidden back tab top. Provides an attractive accent to every window treatment in your living room, bed room, bathroom, kitchen, and kids room. Installs easily with included hardware and installation instructions. Sturdy, easy clean, no fuss, wipe clean finish will last for lifetime. This window curtain rod and finial set will add the perfect finish accent to any window treatment and adds a refined style to your home decor. This curtain rod & finial set is beautifully made and dresses up my closet with lots of sparkle. I especially like the reflective finish of the mosaic and the brushed silver together. I paired this set with a white sheer panel with a grommet top. This install was terrible. One of the finials came attached to the wrong piece, mid bar section. Because of this the bar would not fit together. It took us some time to figure out we needed to remove the finial and attach it to the other piece of rod. The screws provided were terrible and we chose to replace them. It is a beautiful looking rod but the installation was frustrating. These curtain rods are so pretty. I love the silver finish, and the glass balls add some glam. I bought them for a master bedroom and bath. They were easy to put up. Very well-made (sturdy). Arrived with 3 mounting brackets (one for the center). Color and finish are very nice on rods, and the mosaic work in finials is done very well. This rod is beautiful mounted above my step daughters window. It matches the room decor perfectly &lt;3 it’s a little odd because the balls on the end screw on and off so I was convinced it was broken at first. Beautiful, and adds a little extra to the room. 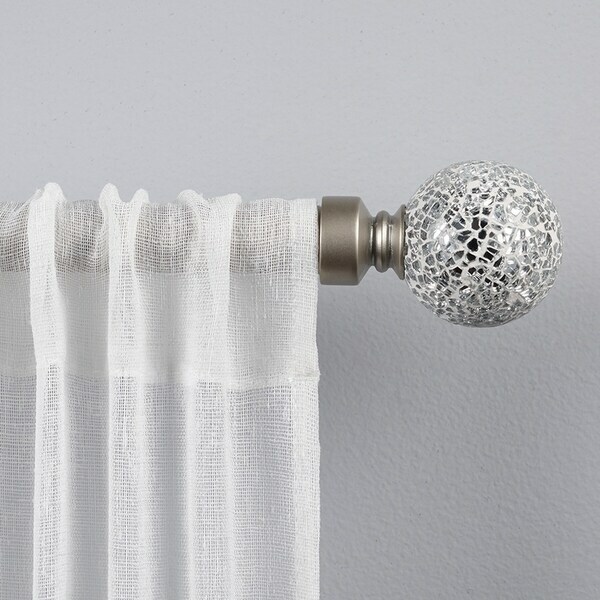 I am so happy that I chose this curtain rod because it is elegant and stands out while drawing attention to the curtains. This beautiful drapery rod adds just the right amount of sparkle to my master bedroom. It was a great value for the price and perfectly matches my new drapes with nickel grommets. I love this curtain rod! It's so pretty and gives the perfect pop to my living room. Looks just like the picture. Pretty. Mosiac is not well put together but you have to look closely to see that. It has a touch of glam without being over the top.